Last winter break, I arrived in Quebec City, Quebec, Canada for the Wharton Leadership Ventures Winter Wilderness Experience – and I had absolutely no expectations. All I knew was that I would be dog sledding and snow shoeing with a group of people who I had never met before, in a place completely unfamiliar to me. I also knew that the trip was focused on leadership, but I had no notion of what kinds of lessons I would learn. Despite this lack of knowledge, I was still very excited, and I was not disappointed. Over the course of four days, I learned a great deal about myself and what it means to be a leader, along with having an amazing experience and building new relationships. One of the first lessons that I learned was that any time I have the option to work with an expert, I should take it. In doing so, not only did I gain valuable instructions and tips for the task at hand, but I learned some new leadership skills as well. This became apparent on our first dog sledding outing when I was in the group with our guide, Max. I was initially on the sled behind him, but about halfway through the ride he asked if anyone wanted to switch and go on his sled. Despite my hesitation, I volunteered. I walked up to the sled expecting to ride, but he told me to step on the brake – I would be driving and leading our group. Despite my nervousness, I ended up learning more in the next hour than I would on the rest of the trip. He taught me when to break and which commands to say, and it was also interesting to see how he told the dogs to go left or right and kept control of the sled using commands. We also went down the biggest hill of the trip while I was driving, but he guided me through every step of the process. After this descent, I was able to guide one of my peers down the hill two days later, and I never crashed the sled! The trip also gave me a great opportunity to work with a diverse group of people with a wide variety of opinions. The value of including everyone’s input was exemplified when we tried (and failed) to start a fire during survival training, and giving everyone a chance to be involved was crucial when we made two giant snow caves on the third day. 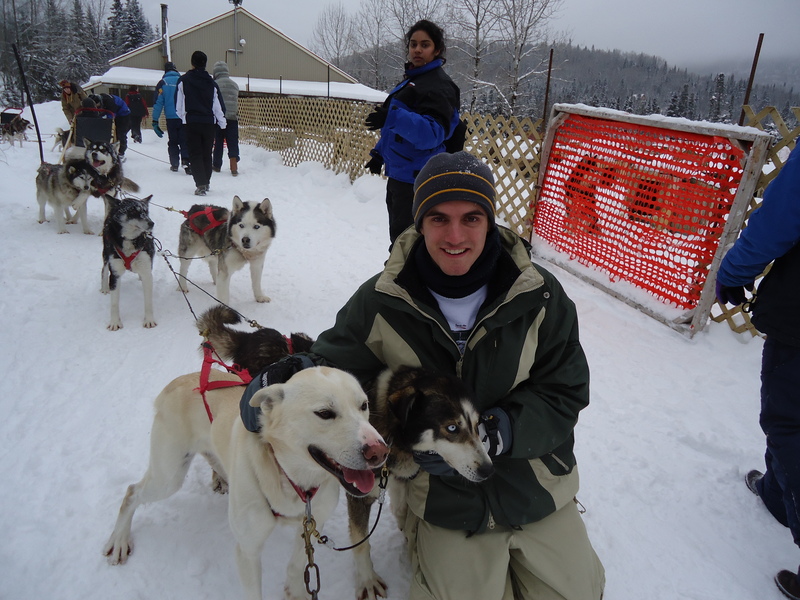 And when we got back on the dog sleds, it was amazing to see how much mindset made a difference. There’s a big difference between not knowing how to drive a dog sled, and not knowing how to drive a dog sled yet. The last simple but important lesson that this venture taught me is that I should always be open to meeting and working with new people. After introducing myself to everyone, I quickly realized that this was a great group of people who were just as excited to be in Quebec as I was. Throughout the trip, I learned a great deal about everyone and established new friendships that I have continued while back at Penn. Looking back, these relationships may be the most valuable part of all. Max is a current M&T junior in the Class of 2014. He is majoring in Bioengineering within Penn Engineering and has yet to declare his concentration in the Wharton School.